The Challenge harness is built for group-use activities like ropes courses as well as indoor and outdoor climbing and mountaineering. 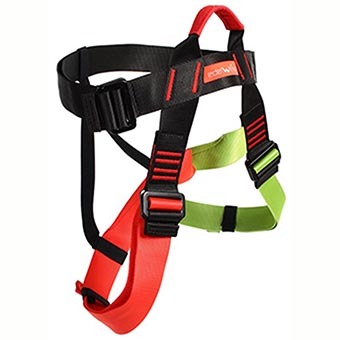 Adjustable unpadded harness with three auto locking buckles. A single visible attachment point, closing of the waist on the right side, and two different leg colors for ease and speed of use.